Are Mobile Phones Pushing Cyber Cafes Out of Business? When last did you visit a cyber cafe? Eight years ago, my answer would have been “right now”. I would have been writing/reading this on a computer in a cyber cafe. Right now however, I am lying somewhere comfortable in my home, whilst punching the soft keys on my laptop. A few years ago in Accra, one could count more than ten Internet cafes between Vodafone (then Ghana Telecom)’s Head Office around Kwame Nkrumah Circle and BusyInternet on Ring Road Central. There were: True Internet, WWWPlus Mega Cafe, Krofa Internet Cafe, Java Internet Cafe, and several others, whose names I do not remember at this time. Sadly, most of them have closed shop. Whilst several reasons could be offered for the failure of these enterprises, one cannot overlook the solid impact of mobile phones and mobile internet technologies. A quick glance at the traffic metrics website Alexa.com reveals that the most visited websites in Ghana include: Facebook, Yahoo, Google, YouTube, Live.com, Wikipedia, MSN, GhanaWeb, BBC. Email used to be the most popular online activity in this part of the world but social networking websites seem to have taken the lead in recent times. News websites come third. Thus, the composition of the ten most popular websites is not much of a surprise. What is more interesting is that ALL the most popular websites have mobile versions of their services. Typing facebook.com into a mobile web browser for example, automatically redirects one to a mobile version of the popular social networking website. The mobile websites are stripped-down versions but offer a lot of functionality, in a layout small enough to fit into tiny mobile phone screens. It is thus now common place to find people get busy with chatting, twittering, reading the news & more, from their mobile phones. Smartphones are raising the stakes and pushing more possibilities into our hands, literally. They now have enough processing power to stream high-definition video and enough memory to download and store databases of music, photos and videos from the Internet. Some smartphones come with full QWERTY keyboards and thus making typing a pleasure. Emailing, blogging, chatting can now be done virtually anywhere. Used and probably refurbished PCs even drag the entry costs lower, for obvious reasons. Those little devices have further democratised internet connectivity. Where mobile phones and smartphones are not enough, one could easily buy a USB Modem for as low as 60 Ghana Cedis (about $42) and connect it to a desktop, laptop or netbook for a full Internet experience. MTN Ghana is currently offering their USB modem at that price. Gone are the days when one needed to obtain a hard-to-comeby fixed phone line from the telecom monopoly or a fixed wireless antenna pointed at the Internet Service Provider’s radio mast, or a VSAT satellite dish + modem. None of these came cheap. The more spectacular thing is that 3.5G USB modems offer real broadband speeds today. “In those days, around 2000 and 2001, I used to go to cyber cafe, pay money to check my yahoo email. You know the feeling that time was powerful. I was the only one who could browse amongst my friends then. We will go to a cyber cafe and crowd around one system, five of us, and then the systems were always very slow, so if we hear that one cyber cafe somewhere was fast we will go there,” said Solomon Edema, a computer engineer. “Now, all of us browse with our phones. I also used my laptop. I have not gone to a cyber cafe for over a year now,” Mr. Edema, adds. Nowadays, the proliferation of computers and 3G mobile phones, including the famous China phones, has resulted in cheaper prices. 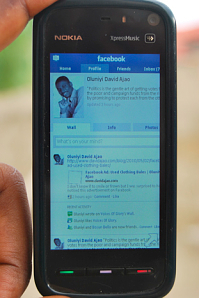 As a result more people can afford internet-enabled phones. Similarly, the competition in the telecom industry has also led the telecom firms out-doing one another in offering cheap modems and internet access. Traders at Computer Village, Ikeja, now offer software that enable free internet access on laptops and mobile phones. It is clear that mobile phones, are pushing cyber cafes out, the same way public phone booths and “communication centres” have become endangered species. What waits to be seen is how long the few cyber cafes that remain would last. Would they close shop or evolve their business model? Time would tell. I am an Internet entrepreneur & technology enthusiast with strong interests in web design & hosting, writing about mobile communications technologies, and blogging. While I appreciate the democratization of Internet access that mobile phones bring, I will miss the sense of community that Cybercafes bring. I know that when I go to an Internet cafe, I am among my people – netizens and I can talk geek and not be odd. With their passing, I will again be cast out into the world, wandering among its citizenry, looking for kindred spirits. Cyber operators in Estates and CBD are crying foul over the move by Safcom to offer almost free internet services to the mobile users. Safaricom head of Corporate Communication, Washington Akumu, says that “Its business and there are just lots of things you cant do in the phone. You will still need a PC, Laptop or netbook to do some serious stuff on the net. But the businessmen are crying of sabotage. They argue that Safaricom provides them with connection and still goes ahead to compete with them. James Wachira who operates a Cyber Business in town says “These are behaviours of a dominant player and it is sad that Safaricom is engaging in these acts of Sabotage (Sabotage reviews)“. Cybercafé patronage in the country is declining in favour of individual subscription as telecommunications operators (Telcos) continue to roll out cheaper and innovative broadband internet services, industry analysts told BusinessDay at the weekend. Confirming the development, Ross Bateson, spokesperson for the Global System for Mobile Communication Association (GSMA) told BusinessDay that only 66 percent of users accessed the internet from a cybercafé in 2009 down from 82 percent in 2008, as workplace, home and mobile usage increased. “Cyber usage is declining in favour of individual subscription”, he said. An analyst told BusinessDay this has also translated into revenue loss for operators of Cybercafes and job loss for those who work in those places. A prominent analyst told BusinessDay earlier that the bulk of telecoms revenue was expected to come from mobile broadband and data services in the next five years. To this effect, mobile network operators are paying keen attention to data (internet) services as the new revenue generating stream. most rural communities in Africa still lack any broadband access. depending on how you interpret ITU data, just 1% (or so) of rural populations have broadband access. in these areas, where most Africans still live, the shared access model is still struggling to become sustainable, largely for lack of affordable broadband and higher overall infrastructure costs. we need to do better at transplanting telecenters from urban to these rural areas. Because the cafes learnt how to change with the times and offer new models to survive. CYBER CAFE OWNER ARE VERY DIS POINTED WITH MOBILE INTERNET,PHOTONE ETC. I AM ALSO RUNNING A CYBER CAFE, 5 YEAR AGO IN MY CAFE NO PLACE WAS EMPTY BUT NO ALWAYS EMPTY, I AM GOING TO CLOSE MY CAFE……….. IS JUST NO ME, MANY CAFE OWNER AS DOING SAME……..